What are the most essential attractions in Bogota? Want to explore the most essential attractions in Bogota? This article will highlight four points of interest you won’t want to miss. Despite the inequality that makes it hard to conceive this concept in your mind, Colombia is a wealthy country, and it has been for centuries. 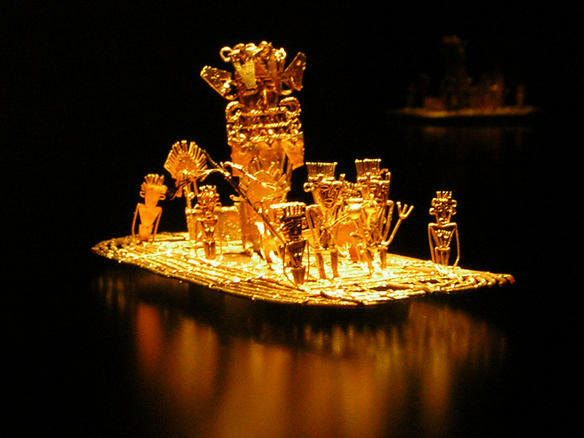 A couple hours spent poking around the Gold Museum will bear this out, as its massive collection of pre Hispanic gold artwork will dazzle those that witness them. Be sure to not miss the Muisca raft, as its size pays tribute to the decadence that the upper classes showered themselves with back in the days of old. While Bogota’s elevation is relatively high in and of itself, peaks still tower around and within the city limits. Cerro de Monserrate is one of these summits that attracts a lot of attention, as it is located relatively close to the city center. If you are feeling a bit tired (or lazy), you can catch a ride to the top on a sky tram, or if you are looking for an opportunity to work those quads, a trail is available from the base to the top. Take care during the week day, as there have been reports of muggers staking out the route during these times; to lessen your risk, try to do the path on a weekend, as police officers and more people increase the area’s safety considerably. Located in the historic heart of Bogota, Bolivar Square is a gathering place that pays tribute to the revolutionary that helped drive the Spanish out of Latin America, thus allowing the constituent countries that were once colonies of the Spanish crown to govern themselves. Today, this spot is an excellent place to watch the people of Bogota go about their daily business, and with the Palace of Justice, National Capitol, and the Primary Cathedral of Bogota surrounding the central part of the square, there will be plenty of buildings for you to explore here as well. Ranking as Colombia’s largest botanical garden, the Bogota Botanical Garden is home to plants from every climatic zone in the country. From the sticky and wet tropical lowlands of the Pacific Coast, to the hardy plants that cling to life on the edge of the zone of eternal snow (yes, Colombia has glaciers), any plant lover will come away from this place impressed.